Running Press Kids, 9780762449514, 256pp. Thanks to her dangerously cute co-counselor, Quinn, there may be a slim chance for survival. However, between the campers' unpredictability and disregard for personal space, Cricket's limits get pushed. She will have to decide if suffering through her own handicapped hell is worth a summer romance—and losing her sanity. Bethany Crandell writes young adult novels because the feelings that come with life's "first" times are too good not to relive again and again. 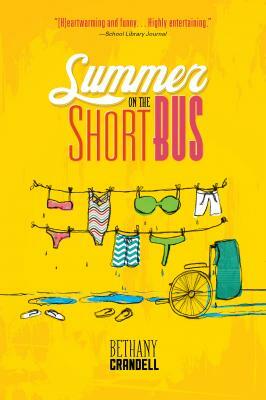 Summer on the Short Bus is Crandell's debut. She lives in San Diego with her husband and two daughters, one of whom is differently-abled. Visit Bethany online at bethanycrandell.com and Twitter @bethanycrandell. "In her debut novel, Crandell draws from her experience raising a daughter with cerebral palsy, sensitively conveying the impact of stereotypes and hurtful comments without resorting to moralizing. Uncomfortable moments, unflinchingly conveyed, are gingerly balanced with a sense of humor. Crandell creates a maddening yet sympathetic character in Cricket, who is realistically slow to learn her lessons in compassion and human kindness. "